Here is a fine example of an 80s one hit wonder that rarely gets played on the radio, which you could be forgiven for not remembering. During the latter half of the 80s, there was no shortage of Australian soap stars in the charts, but in 1981, it was a british soap star from Crossroads that managed to score a No.2 hit. Robbins actually released her first single in 1978, a cover of "Tomorrow" from the musical Annie, which is owned by Paul McCartney's music publishing company - Robbins is actually the first cousin once removed of Paul McCartney. She scored a minor hit with the 1980 single "Love Enough For Two" (as part of Prima Donna) which reached #48. Prima Donna represented the UK in the 1980 Eurovision Song Contest and finished in a very respectable third place - a position that UK entrants can only dream of these days! The group included her sister Jane, and the brother of Bucks Fizz's Jay Aston, Lance, as well as Sally Ann Triplett, Danny Finn and Alan Coates. The group also released another single during 1980 "Just Got To Be With You" which failed to chart. In 1981, Robbins teamed up with Beyond to release "More Than in Love". Beyond had lost out to Bucks Fizz in the UK's Song For Europe contest. The single entered the UK singles chart at #28 on 24th May, in the same week that Bucks Fizz fell from #16 to #26 with their skirt-ripping Eurovision winner "Making Your Mind Up". Robbins climbed to #13 the following week, before reaching a peak position of #2 for one week on 7th June, with Smokey Robinson at #1 with "Being With You". The single slipped back to #3 (where it remained for two weeks), with Michael Jackson climbing to #2 with the title track from his compilation album "One Day in Your Life". Robbins provided the backing vocals for the song "Story of the Blues" by Wah!, although did not appear on their Top Of The Pops performance, as she was replaced by Sylvia and the Sapphires. Robbins penned the theme tune to the ITV show Surprise, Surprise (sung by Cilla Black) and also provided numerous female voices for the satirical puppet show Spitting Image for 9 years. She was also the voice of the Channel 4 TV series Eurotrash. Kate joined Crossroads in 1981, playing the part of a pop singer who recorded songs in the basement of the fictional motel. The singer's most recent album was released in 2014 and entitled We're Just Passing Through. Her most recent TV appearance was on the 2018 edition of ITV's I'm A Celebrity Get Me Out Of Here, as the mother of contestant Emily Atack, who finished in second place. 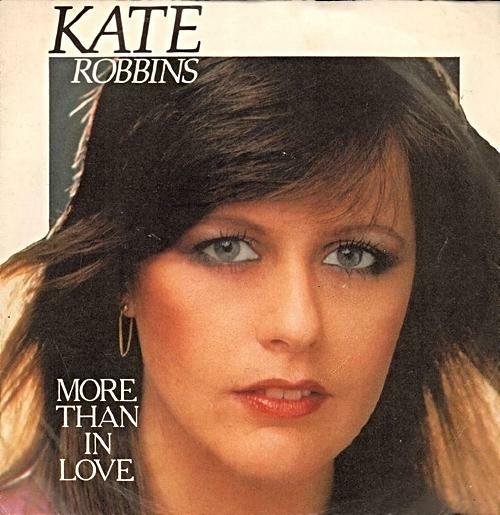 "More Than in Love" featured on Kate Robbins self-titled debut album.